Well after finishing, what I guess you call, the mini 120V hybrid PID BrewTroller controller I had to keep going since I was on a roll. When I decided to integrate the basic BrewTroller BX1 board into my system so I could begin to see how I can exploit all it’s features. Well one of those features is it’s ability to measure volumes in a vessel using pressure sensors. Volume measurement is not only convenient it helps improve brewhouse efficiency through the ability to accurately determine strike water volume, pre-boil and post-boil volumes. Volume measurement is achieved by using pressure sensors and a vertical small diameter tube mounted in the vessel with the end of the tube as close to the bottom as possible. When height of the liquid increases in a vessel the pressure also increases in the tube as the liquid rises in it. The tube is connected to the sensor with flexible tubing. The sensor sends a signal to the BrewTroller and it is interpreted by the BrewTroller software. After entering a few reference calibration points in the BrewTroller software it is very accurate. One problem is when temperatures in the vessel decrease a vacuum can be created in the tube but if a steady stream of low pressure air is fed into the tube the interference is eliminated. This is accomplished by using a small air pump like those used for aquariums. The diagram below, from Open Control Systems, shows how a “bubbler” system is setup. Armed with this knowledge, and a couple free scale sensors, I was ready to build the sensor enclosure. I decided to do a remote enclosure for the volume measurement components for a couple reasons. First of all there is no way it would fit in my latest creation and secondly the motor on the pump could cause EMI interference with the BrewTroller itself when in the same enclosure and sharing the same power supply. An added benefit is if I’m not using the BrewTroller I can just disconnect the sensor setup and if I ever built another BrewTroller control panel I would already have the volume measurement part ready to go. Having two sensors gives me the flexibility of monitoring volumes in two vessels when brewing two vessel Brutus 20 style. First obstacle was what to use for an enclosure? Well since everything else in my system is compact it was obvious I would need to keep this project the same. Luckily the local Radio Shack had a plastic project box for $6.00 that is 6″ x 4″ x 2″, perfect. Next was the air pump and even the smallest aquarium air pump would be too large for the small project box. Well we had a dead Keurig coffee maker and I knew they had an air pump of some sort. Score! After tearing it apart there was a small 12V air pump and a bunch of small silicone tubing in the thing. Easiest way to power the air pump and keep things compact was just to use an AC wall adapter I had laying around. The sensors would get their 5V power through the data cable from the BrewTroller. I had the panel jacks for the power and data cable connections as well as a power switch for the pump. The data cable was four conductor cable from a dead computer keyboard. The only other thing I needed was a couple small tees and valves for the air lines and a quick trip to the pet store solved that. The valves allow you to adjust the flow of air going to the stainless tubes in the vessels to a slow flow of only a few bubbles a second. The assembly was very straightforward after a couple quick mockups. I did decide to use some quick disconnect fittings, I found on eBay, for the tubing that will go from the box to the vessels to keep things cleaner and easier to store when not being used. The only difficult part of the build was constructing the cable that goes between the sensor enclosure and the BrewTroller control panel. The 4-pin mini XLR connectors have tiny solder connections that are embedded in a not so heat resistant plastic and they are very close together. After some very careful soldering it was done and everything worked as it should, the BrewTroller detected the sensors and the air pump worked great. As soon as I finish some work to the kettles it will be time to brew a batch and try everything out. Meanwhile a brew day on the previous system is definitely in order since the beer reserves are running low. Thanks for stopping by and checking out my blog and as always I hope, somewhere within in my posts, there is something that makes you think, encourages you to try something different and makes you want to come back for more. Be sure and follow me if you would like to receive notifications of new post by me. 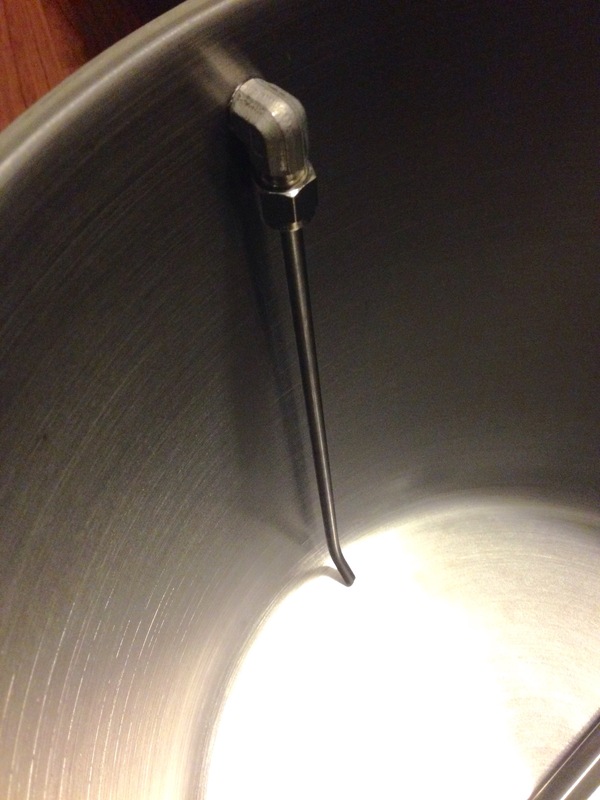 The crazy things a home brewer will try…. More uniform power output. Finer power control. The rotary nub is easier to adjust than the small keys on a PID. Well since I wanted to add something new to the new controller this sounded like what I was looking for. Simple device with great benefits that I wanted to try. In the beginning of the “idea” I figured I go from the original 6″ x 6″ x 4″ enclosure to a 8″ x 8″ x 4″ enclosure. Made sense since the original enclosure was a tight fit and I was going to add another device that was basically the same size as a PID. This is where all normal thinking and common sense just flew out the window. I started thinking “well I do like the smaller enclosure I’ve been using”. Hey I have a small brewing system, brew small batches and don’t have a lot of space…and the rationalization worked, I was staying with the same 6″ x 6″ x 4″ enclosure. A little careful planning and it would work, yeah keep telling yourself that Kevin. Heck the new boil controller only requires a 120V AC power connection and has a standard DC SSR output. My plan was to simply copy the layout of the old setup, cram the boil controller in there and then connect the SSR output from both the PID and the boil controller to an on/on DPDT switch with the switch output to the SSR so I can just flip the switch, when it comes time to begin the boil, to the new digital boil controller. I picked up the new enclosure and started laying out where the components would need to go. In the process of the layout I was digging through my bins of parts and found my BrewTroller parts! Okay fair warning, this is where my sanity became questionable. I’ve had the basic BrewTroller BX1 board and always wanted to start playing with it to see what its capabilities are and see how I can integrate into my brewing but kept putting it off. The BrewTroller system is very powerful yet fairly easy setup but I still had reservations since I would have to throw together some sort of enclosure, another SSR, wiring, outlets etc, basically duplicating everything I already have. What if something happened on the inaugural brew? Then what? Well I warned you…why not integrate the BrewTroller into the new controller? BrewTroller has the same DC SSR trigger for the heating element as the PID and boil controller and I already figured out how to simply select the SSR output with a switch…so why not? Add another on/on DPDT switch to select between PID and BrewTroller, something goes wrong just swap the temperature probe to the RTD one for the PID in the wort recirculation path, flip the switch and your back to brewing! So now you’re thinking “this is where he comes to his senses and decides to go with the bigger enclosure” nope. The original single PID design was a tight fit, then I decided to add another PID-sized device to same size box and now I’m adding additional connections, switches, the BrewTroller circuit board and the dial encoder control and LCD display for the BrewTroller. Ok now I’m beginning question my own sanity but the project now became a personal challenge, can I make it fit? Well now I had to figure out how to make it fit and get a few components I didn’t have. After some online searching I found the components I needed without breaking the bank since I have a tight budget for this hobby. After a lot of measuring and doing many, many mockups and dry fit of components I had a good idea of how it had to be laid out. I began cutting the holes in the enclosure for everything. Now I got stalled, I wanted to make this look nice and well made but cutting an opening for the BrewTroller LCD display with the Dremel wasn’t good enough. I wanted to have that trimmed out nicely instead of my attempt to cut a perfect rectangular opening in the enclosure lid, problem is no one makes a bezel for the 20×4 lcd display. Tons for the 16×2 LCDs but I couldn’t find anything for the larger 20×4 display. Finally after several weeks of searching the web I found a small company that actually makes the bezel I was looking for and it was less than $5. Then it happened, I remembered that the BrewTroller requires 12V DC power. Initially I had moment of reason and was going to use an external AC wall adapter with a power jack on the enclosure for the 12V but noooo I couldn’t do it. Already packed box but there was a small corner I could fit a small power supply. Back to searching the web and finally found a 12V 2.1 amp power supply that was only 1″ wide and 2-3/4″ long, it will fit! Since I was now mounting a power supply in the enclosure that will generate some heat, as will everything else in there, and the BrewTroller is basically a computer so I needed to add a fan. I had a small 12V 40mm laptop fan that fit on the side and I added a vent hole on the bottom to exhaust the warm air. Now I began to become intimidated by the pending assembly. I knew it would not be a one day project but even with that common sense twist on the project it just kind of sat in the kitchen for a few weeks. The holidays were approaching so it sat more but then my son went home to visit family over the holidays and it got a little boring sitting around the house. That combined with days of below zero weather coming it was time to start. I started with the goal of installing and connecting certain components each session but quickly realized I had to plan the placement of each wire and the exact order everything would have to be installed in. This was vital in making it work because once one thing was installed I might not be able to access other items, good example is the BrewTroller board. The BrewTroller was going to be mounted under the PID and you can see the green circuit board in some of the pictures of the early stages of assembly. One I installed the PID I would not have any access to the BrewTroller. Each component was installed and tested before moving on to the next item. The 12V DC wiring had to be tested before moving on to the 120V AC wiring, which really was difficult due to the lack of flexibility of the wires themselves. Tiny tools, hemostats, needle nose pliers and reading glasses became my friends. An example of the painstaking planning and tight quarters is one night it literally took 40 minutes to install four wires for the element and pump outlets. Well after that night I had to take a break from working on it for a couple days. I was working 2-3 hours a session for several days and it was nerve-wracking. Finally the last session was on my weekend off and I knocked it out and everything worked!! I couldn’t believe it because to be honest there were several times I didn’t think I could pull it off. After a few programming issues with the BrewTroller, that wasn’t too difficult to figure out, it was working just as it should. Looking forward to brewing with it soon. To summarize what is in the tiny box…PID, Auber Instrument digital boil controller, 25A Crydom SSR, external SSR heatsink, 20A 120V duplex outlet for pump and kettle element, RTD temp probe connector for PID, pump and PID power switch, PID/Boil controller selector switch, PID/BrewTroller selector switch, master power switch, BrewTroller power switch, fuse holder for PID protection, BrewTroller BX1 board, BrewTroller dial encoder, 20×4 BrewTroller LCD display, BrewTroller 12V alarm buzzer, BrewTroller 1-wire temp probe connector, BrewTroller volume measurement sensor connector (more about this coming soon), 12V DC 2.1 amp power supply board, 12V fan and exhaust vent, two-position terminal block for 12V power connections, Mini USB connection for BrewTroller program uploading. I have been building brewing controllers for a while now and tinkering with electronics since I was a kid and when people ask for advice I always say “whatever size enclosure you are think of, go bigger” well I guess I should listen to myself sometimes. Will I do it again? No way! No really…as he walks away smiling.